Need compressed and synthetic air in a variety of purities and concentrations? 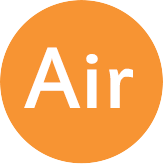 Ambient air can also be compressed for a variety of applications. When combined with a fuel gas, compressed air produces a flame with a lower temperature than an oxy-fuel flame. You can use air-fuel flame for brazing, soldering and carbon coating lower-temperature alloys. An air fuel flame can give welders greater control over the thickness of the carbon coat. Please see the table below for information and to access safety data sheets on air mixtures available from WestAir. You can also use compressed air for pneumatic drills, plasma cutting and metallurgical processes. You can use synthetic air as a zero-gas when operating and calibrating environmental monitoring and test equipment. You can also use synthetic air as a balance gas in many calibration mixtures and as an oxidizer for flame ionization detectors in laboratories. Compressed and synthetic air comes in a variety of cylinder types and sizes to meet your purity and volume requirements.